You should have the confidence that with only the wind and a small scale wind turbine you can power the whole house you live in. Wind turbines capture the power of the wind and convert it to electricity. Placed in an exposed site, a typical wind turbine system could easily generate more power than your lights and electrical appliances need. •Savings on Electricity Bills: Wind is free, so the only cost you would need to pay is the material and installation fee. •Returning on Investment: The Feed-in-Tariffs law allows you to get paid for your generated electricity even if you use it. You can earn money from the electricity generated by your turbine. You can also receive payments for the electricity you don't use and export to the local grid. The wind does not blow everyday but don't worry. 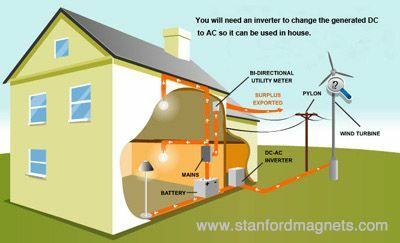 If your home isn't connected to the national grid you can store extra electricity in batteries and use it when there is no wind. By using wind turbines, you can make your contribution to the environment protection and reduce your carbon emission. Maintenance checks are necessary every few years. A well-maintained turbine should last more than 20 years, but you may need to replace the inverter at some stage during this time. For off-grid systems, batteries will also need replacing, typically every six to ten years. The cost of replacing batteries varies depending on the design and scale of the system. Any back-up generator will also have its own fuel and maintenance costs.